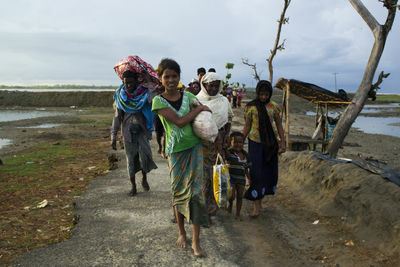 A group of Rohingya people walk at dawn to the processing center for refugees after having disembarked at night in the shore of Bangladesh, fleeing ethnic cleansing in Burma. 17 October 2017. 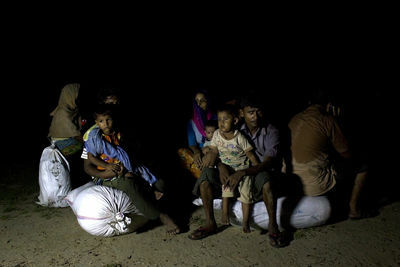 A group of Rohingya people rest at dawn, on their way to the processing center for refugees after having disembarked at night in the shore of Bangladesh, fleeing ethnic cleansing in Burma. 17 October 2017. 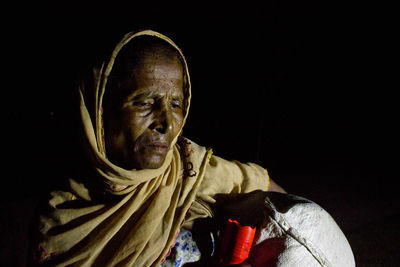 Rohingya mother comforts her exhausted daughter while they are waiting at dawn to proceed to the processing center for refugees after having crossed at night the Naf River by boat to Bangladesh's Shah Porir Dwip Island, fleeing the ethnic cleansing that the Burmese State is perpetrating against their people. 17 October 2017. 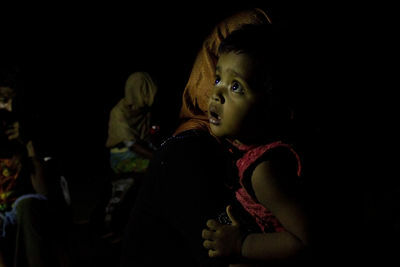 Rohingya mother with her daughter, in group of Rohingya people resting at dawn, on their way to the processing center for refugees after having disembarked at night in the shore of Bangladesh, fleeing ethnic cleansing in Burma. 17 October 2017. 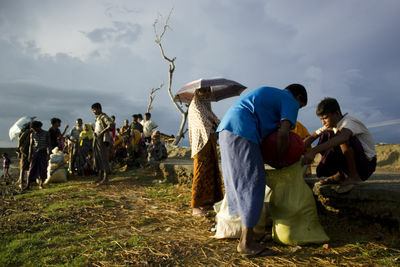 A group of Rohingya people rest at dawn, on their way to the processing center for refugees, after having disembarked at night in the shore of Bangladesh, fleeing ethnic cleansing in Burma. 17 October 2017. 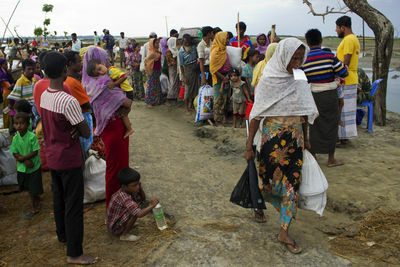 A group of Rohingya people are checked by the Bangladeshi Army on their way to the processing center for refugees, after having disembarked at night in the shore of Bangladesh, fleeing ethnic cleansing in Burma. 17 October 2017. 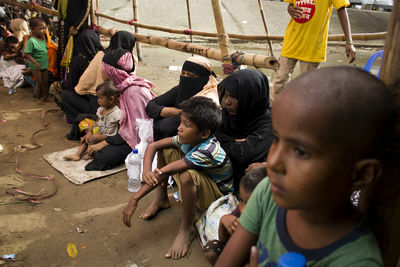 A group of Rohingya women and children wait at the processing center for refugees near Sha Porir Dwip Island, to be identified and taken to one of the sprawling refugee camps in Bangladesh. 17 October 2017. 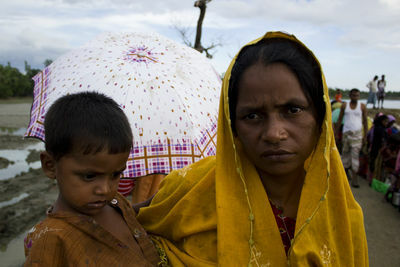 Rohingya mother and her son while waiting at dawn to proceed to a processing center for refugees after having crossed at night the Naf River by boat to Bangladesh's Shah Porir Dwip Island, fleeing the ethnic cleansing the Burmese State is perpetrating against their people. 17 October 2017. 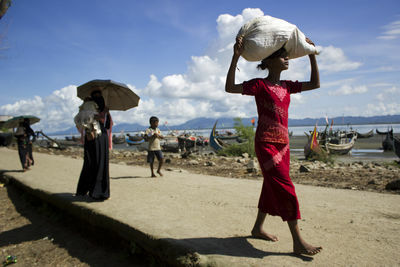 Rohingya man and woman walk at dawn to the processing center for refugees after having disembarked at night in the shore of Bangladesh, fleeing ethnic cleansing in Burma. 17 October 2017. 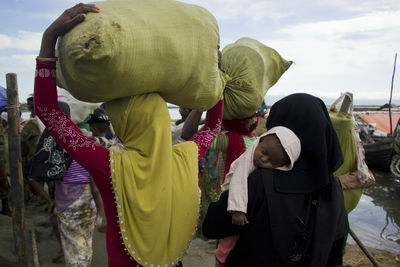 Rohingya women walk at dawn to the processing center for refugees after having disembarked at night in the shore of Bangladesh, fleeing ethnic cleansing in Burma. 17 October 2017. 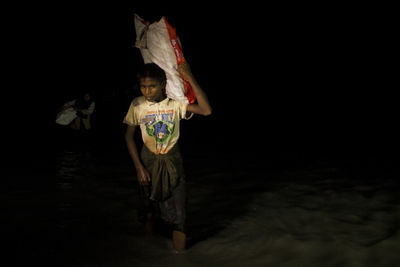 Rohingya mother plays with her son while they wait at dawn to proceed to a processing center for refugees after having crossed at night the Naf River by boat to Bangladesh's Shah Porir Dwip Island, fleeing the ethnic cleansing the Burmese State is perpetrating against their people. 17 October 2017. 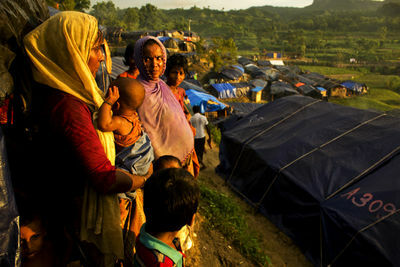 More than 600,000 Rohingya refugees have crossed to Bangladesh fleeing a campaign of ethnic cleansing carried out by the Burmese military since a recently emerged Rohingya insurgent group, the Arakan Rohingya Salvation Army (ARSA), launched a series of coordinated attacks against positions of the Burmese security forces on 25 August. 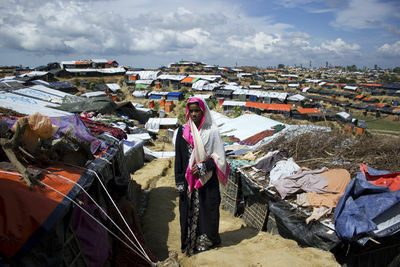 This is already the fastest human exodus since the genocide in Rwanda, and Bangladesh, an impoverished and overpopulated country, is barely able to cope with the refugee influx. 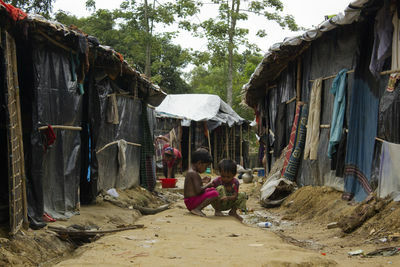 The Rohingya have suffered severe persecution from the Burmese government since at least the late seventies, they were rendered stateless decades ago and are branded as "Bengalis", implying they are illegal immigrants from Bangladesh, despite the fact that they have deep historical roots in Arakan, a Buddhist-majority region in the northwest of Burma. These pictures were taken over a period of seven days on October 2017 in Cox's Bazar, the district in Bangladesh to which the Rohingya refugees flee and find shelter in overcrowded and overwhelmed refugee camps. 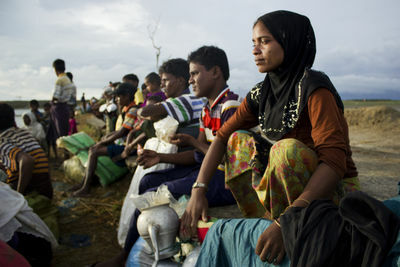 A group of Rohingya refugees wait to continue their journey in Shah Porir Dwip Island, in the Naf River which divides Burma from Bangladesh, after crossing the previous night from Burma. 13 October 2017. 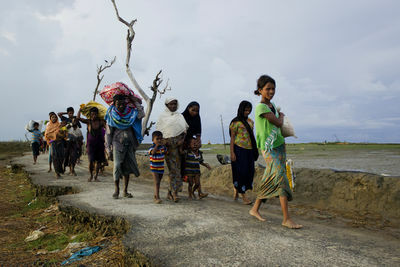 A family of Rohingya refugees walk in Shah Porir Dwip Island, in the River Naf, which separates Burma from Bangladesh, after having arrived from Burma the previous night. 13 October 2017. 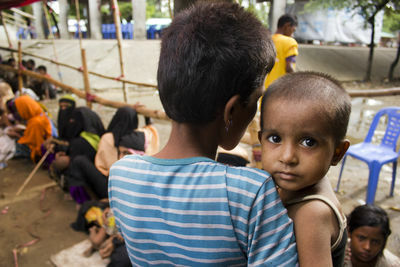 Rohingya child in the arms of her mother, part of a group refugees resting near the shore of the Naf River, in the Bangladeshi island of Shah Porir Dwip, while the Border Guard of Bangladesh count them, shortly after having disembarked in the country, in their escape from the ethnic cleansing their people people is suffering at the hands of the State in Burma. 13 October 2017. 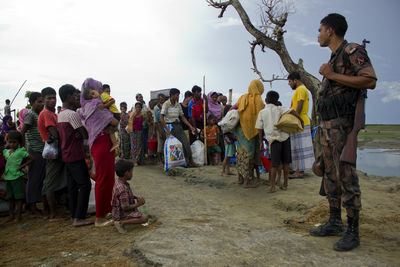 A group of Rohingya men line up in front of the Border Guard of Bangladesh shortly after having disembarked in Shah Porir Dwip Island, in the Naf River separating Burma from Bangladesh, after fleeing the ethnic cleansing their people are suffering at the hands of the State in Burma. 13 October 2017. 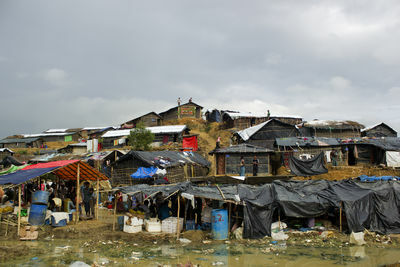 Huts in Balukhali refugee camp where thousands of Rohingya huddle after fleeing ethnic cleansing in Burma. 12 October 2017. 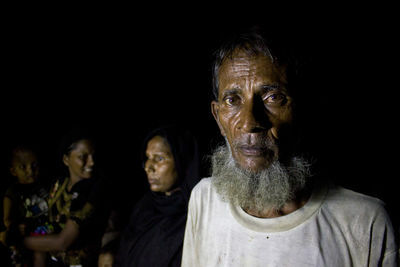 Rohingya refugee arrives at night to the Bangladeshi side of the Naf River in Shah Porir Dwip Island, fleeing the ethnic cleansing her people is suffering at the hands of the Burmese State. 13 October 2017. 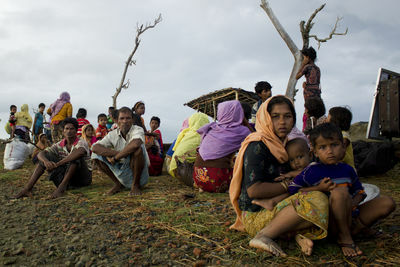 A group of Rohingya refugees rest near the shore of the Naf River in the Bangladeshi island of Sha Porir Dwip while the Border Guard of Bangladesh count them, shortly after having disembarked in the country, in their escape from the ethnic cleansing their people people is suffering at the hands of the State in Burma. 13 October 2017. 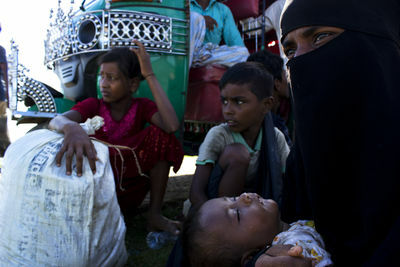 Group of Rohingya women and children at Nayapara Refugee Camp, in Bangladesh. 12 October 2017. 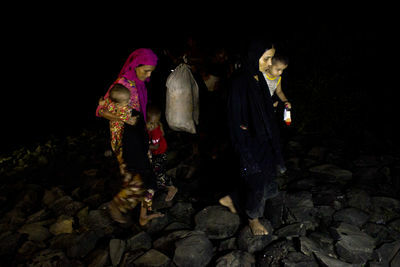 TestinRohingya refugee arriving at night to the Bangladeshi side of the Naf River in Shah Porir Dwip Island, fleeing the ethnic cleansing her people is suffering at the hands of the Burmese State. 13 October 2017. 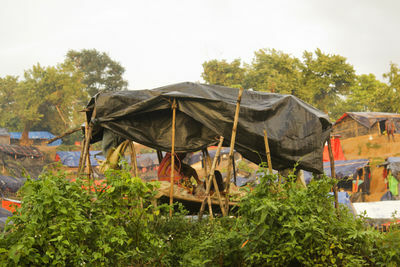 Rohingya woman rests at her makeshift hut in Nayapara Refugee Camp, in Bangladesh. 12 October 2017. 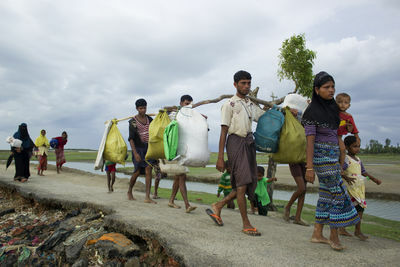 Rohingya refugees arrive to Shah Porir Dwip Island, (Bangladesh) in the Naf River, which serves as border between Burma and Bangladesh, fleeing the ethnic cleansing that the Burmese State is carrying out against their people. 13 October 2017. 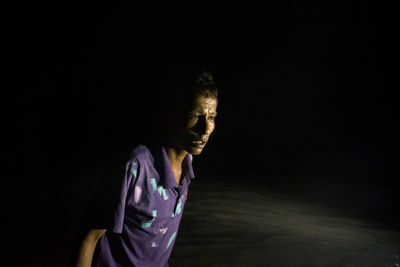 TestingRohingya man disembarks at Shah Porir Dwip Island, on the Bangladeshis side of the Naf River separating Burma from Bangladesh, after fleeing the ethnic cleansing the Burmese State is perpetrating on his people. 13 October 2017.